The Greeks have a word for it. Well the Greeks have a word for just about everything, but I kind of like that phrase, ‘The Greeks have a word for it’. Okay let’s get on with things…. I’d like to tell you about one of the simplest and tastiest soups you can ever make. This is real Store Cupboard Soup and almost (really, almost) Instant Soup. Avgolemono means egg and lemon in Greek, see, told you the Greeks had a word for it, now you know a word of Greek! All you need to make this are 4 ingredients, well okay 5 if you add seasoning, which of course you’ll do anyway, so let’s not count that as an ingredient. Pour the chicken stock into a pan and bring to the boil. 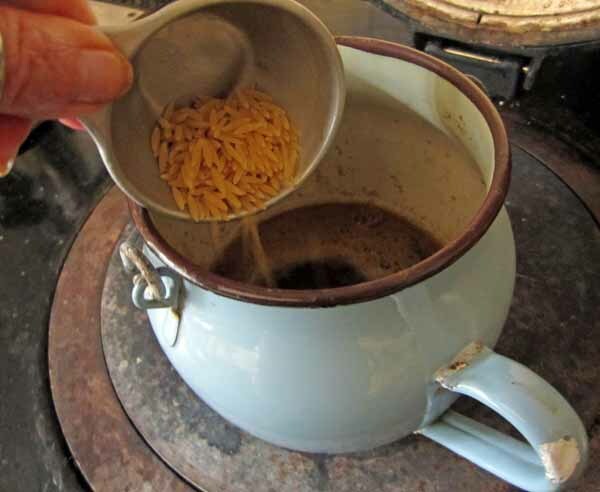 Add the Orzo (this is a Greek pasta that looks like oversized grains of rice) but if you can’t get this sort of pasta just use any of the tiny shapes that are used for soups. Boil for 5 minutes or until the pasta is tender, then lower heat to gentle simmer. Break the eggs into a nice big bowl and whisk like mad to get them all light and fluffy. Cut the lemons and reserve half of one lemon to create slices for garnishing. Squeeze the juice into the eggs and whisk again. Now VERY S L O W L E Y add a ladle of the hot stock. This must be done slowly as you don’t want to scramble those eggs. Just drip it in. Mix well and add another ladle of stock in the same way. 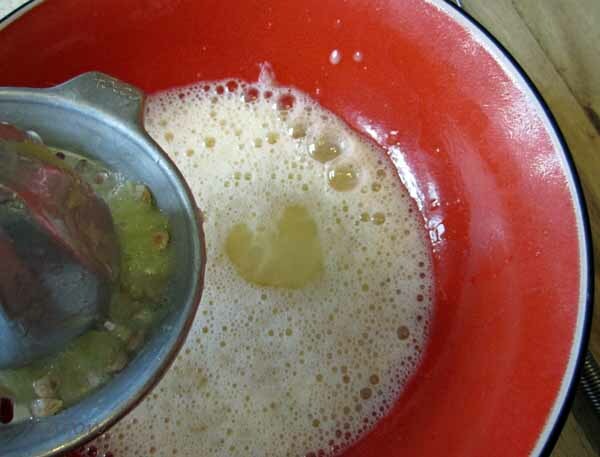 Gently pour the stock and egg mixture into the pot of stock. Double check that the heat is just on low for this as you MUST NOT boil this soup now. 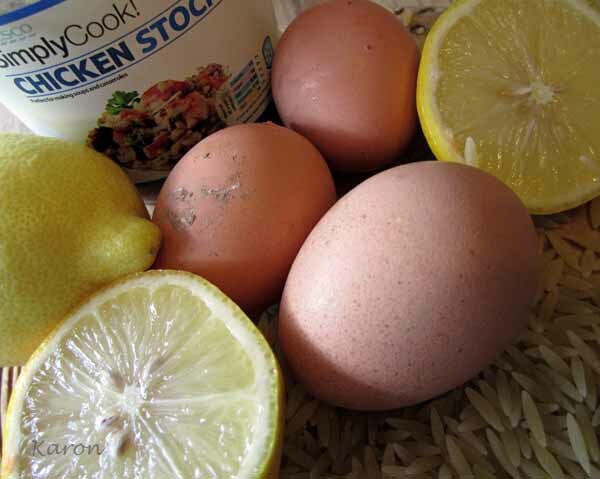 If it boils you’ll end up with a nasty mess of lemony scrambled eggs floating in stock, so unattractive daarling! 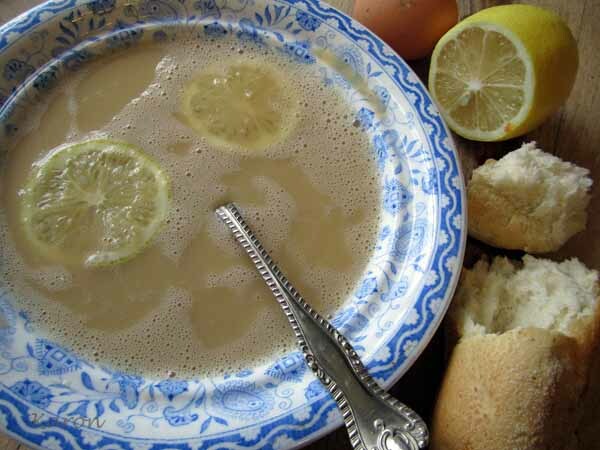 Serve the soup with crusty bread and float a couple of lemon slices on top. Sunshine in a bowl whatever the weather. My heart goes out to you. I wish you were here to share some sunshine soup. I know all about the house trap situation only too well. Looks simple and yummy and warm and wholesome. Simplicity itself. Raining here just now.